If you aren't familiar with the term "barn find," it's a car that has spent the past decade (or three) hidden away inside a barn or garage, forgotten until someone stumbles upon it like some priceless historical relic. Just like an eerie abandoned ghost town, rest stop, or train station, there's something fascinating and weirdly beautiful about the slow decay of a classic car. Sometimes a barn find turns out to be a highly lucrative discovery -- entire collections of multimillion-dollar cars have been found, preserved in a sort of dream garage-slash-time capsule. Below are 26 of the finest you'll find on good ole Instagram, including a couple pretty amazing scores that are currently for sale (hint: buy 'em if you can!). How's this for a barn find? This is the first BMW sold after WWII. The years have actually been pretty kind to it. This is that same BMW. Notice the (likely pretty frail) paperwork that's still in the glovebox. Air-cooled Porsches -- like this one -- have been skyrocketing in value. Toss in the ever-classic targa body style, and you've got a recipe for a true classic once you look past the thick layers of dust. What's cooler than a 1963 Split-Window Corvette barn find? One that's currently for sale, like this one. After a little love and attention, this could very easily be a quarter million-dollar car. There's basically no way this is an original GT40. Who cares, though? Chances are, anyone who discovers anything remotely resembling a GT40 rotting in a barn will die of shock before ever having the chance to verify its authenticity. This one's just poetically beautiful. Like a grandparent Land Rover being taken for a walk. 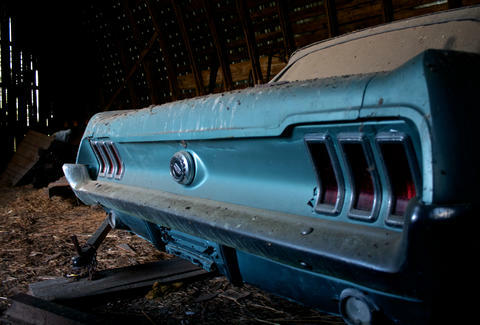 Enjoy the rest of these stunning barn finds below. Aaron Miller is the Cars editor for Thrillist, and can be found on Twitter and Facebook. He doesn't like being anywhere near barns, unless there's a car involved.